Mega Man Battle Network 3, known as Battle Network Rockman EXE 3​ (バトルネットワーク ロックマンエグゼ3) in Japan, is a video game developed by Capcom for the Game Boy Advance (GBA) handheld game console. 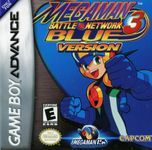 It is the third game in the Mega Man Battle Network series, released in 2002 in Japan and 2003 in North America. While in North America and Europe, two complementary versions of the game - Blue and White - exist, marketed simultaneously, this was not the case in Japan. The game was released in a single version in this region, while a Black​ (ブラック) version containing bugfixes, new areas, optional bosses, and other improvements, was released some months after the original. The gameplay in Battle Network 3 is similar to that of its predecessors, with no graphical enhancements and minor gameplay changes. Gone are the Power-Ups that were to be collected to improve the MegaBuster - instead the Navi Customizer is added, allowing abilities to be added on with certain rules as to how these abilities can be added with respect to each other. Each version of the game has a separate Contest Navi: BowlMan for Blue/Black, and MistMan for White. Blue also includes another Navi, Punk, that could be challenged from time to time. Punk's chip was only available as part of a special promotion in Japan. However, it can be attained via a cheat device or by being traded from Black to Blue. White, on the other hand, has no such Navi. In Battle Network 3 the virus breeder is available, where special, friendly viruses (that must be found first somewhere in the net) are kept and can be fed using BugFrags. When a virus is found and put in the breeder, a chip for that virus is obtained. Feeding each virus BugFrags levels up their chip accordingly. After a family of a certain type of virus has been fed to the max, they will release information to the player as to where the Omega Virus of that family (i.e. For the KillerEye family, they will give you a clue to find KillerEye Omega) can be found. After the Omega Virus of that family is found and deleted, it will join the others in the Virus Breeder and will be available when the corresponding Virus Chip is used. Battle Network 3 introduces further classification of Battle Chips by splitting them into three categories: 200 white Standard chips, 85 blue Mega chips and 25 pink Giga chips. Standard Chips are limited to only four of each kind (even if letter codes are different) per folder. Mega Chips are limited to only five per folder, and only one of each kind. Only one Giga Chip is allowed per folder and only one copy of each Giga chip exists throughout the entire game. These specifications would continue for the remainder of the series. There are certain types of programs (see Navi Customizer) that can boost the Mega and Giga chip limits, though. There are five unique Giga chips exclusive to each version and this would continue for the remainder of the series, although Battle Network 5 offers six Giga chips per version. There are also Program advances which are a combination of three or four chips. Source: Wikipedia, "Mega Man Battle Network 3", available under the CC-BY-SA License.